A major factor in Jeremy Corbyn’s appeal to voters in the recent leadership election – and potentially to the wider electorate as well – was his brave assertion that austerity was the wrong response to recession and was doing absolutely avoidable damage to both economic performance and social cohesion. That assertion not only gave fresh hope to millions dispirited at being told that “there is no alternative” but also opened up a long-overdue debate that brings the Labour party within touching distance of a newly emerging economic policy consensus and that could be of great value both to the party and to the country’s economic fortunes. All the more surprising then that both Corbyn and his Shadow Chancellor, John McDonnell, are still apparently in thrall to a key element in neo-classical orthodoxy. They have found it necessary to commit to reducing “the deficit” and to producing a budget surplus by 2019. It may be that such a commitment is deemed necessary in order to maintain “credibility” with the voters, but if the voters are not to be told that treating such a goal in isolation from any other part of the economy makes no economic sense, when will they ever be told and what meaning can we ascribe to “credibility”? It is, after all, Labour’s long-standing support for, and failure to challenge, the central tenets of neo-classical orthodoxy that has disabled any challenge they have tried to make to any other aspect of the Tory progamme. The confusion is compounded when, like the voters, Corbyn and his team seem on occasion to talk of “the deficit” without distinguishing between the government’s deficit and the country’s. If the deficit they identify were indeed the country’s deficit, they could be applauded – but, sadly, there is little evidence that this is what they mean or that they are even aware of the economic and social significance of the foreign trade deficit we have run perennially for over 30 years. As for the voters, how many of those who support the Tory government’s often touted “prudent economic management” realise that we are now in our fourth decade of living beyond our means, financing our rake’s progress through overseas borrowing and selling off our assets? Shouldn’t Labour be bringing this into the light of day, rather than allowing it to be shrouded in obfuscation? And do the voters, or John McDonnell, realise that – for as long as we have an overseas deficit – a government surplus is just another way of describing the fact that the government is taking more from us in tax than it needs, so that the private sector is left in deficit? And, since the total of the overseas deficit must, as a matter of accounting identity, equal the sum of the private sector and government deficits, how many understand that a sizeable and perennial overseas deficit makes a government deficit virtually inevitable – hence George Osborne’s difficulty in getting his deficit down. None of this means of course that a Labour government would not demand value for money and efficiency in the public sector. But does John McDonnell see that the reductions in public spending that are said to be necessary to eliminate the government’s deficit are in fact a central element in the suite of austerity policies whose main purpose is the political aim of reducing the role of government? Is that the road he wants to travel? He is on safer ground when he distinguishes, in considering the government’s finances, between the capital account and current spending. It makes perfectly good sense, as he suggests and as everyone with a mortgage will understand, to borrow for the purposes of creating capital assets. But, even here, his courage seems to have failed him. In other countries – China and Japan, for example – investment in the future, and particularly in productive capacity, is often financed not by borrowing or selling assets but by government-sanctioned credit creation. The idea is not exactly unknown to us – we call it quantitative easing – but we see it as being used almost entirely for bailing out the banks. The irony is that – when we are obliged to sell assets to make up our overseas deficit – those assets are often purchased by foreign investors using credit created for them by their banking system at their government’s behest. There is no reason why our own banking system should not perform that function – but they are too busy creating credit for lending profitably on mortgage to be bothered. Corbyn and McDonnell talked in the leadership contest about a “people’s quantitative easing” but the idea seems now to have dropped out of sight. A successful alternative to austerity, however, demands the courage to break free from the intellectual shackles that have inhibited fresh thinking for so long. We should not forget that the best and surest way to eliminate the government’s deficit is to get the rest of the economy working properly. Cutting public spending as a means of focussing on the government’s deficit – in isolation from anything else – runs directly counter to that goal. Posted in: Economy, Labour, Macroeconomics, Politics, Public Spending, Trade. Austerity – It’s Not Working and it’s Not Popular! Did I miss something? 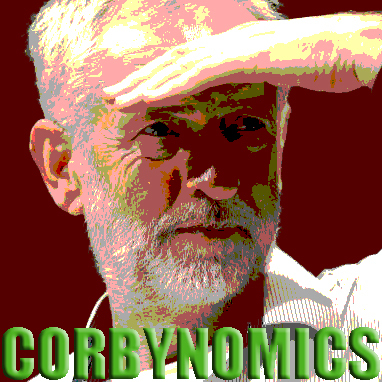 John and Jeremy are committed to producing a surplus by 2019? They have no say in the matter. This is the most fundamental issue facing Labour. We must start explaining exactly how money enters the economy, people think it comes from business activity and lots of people beavering away, when in FACT it is created out of thin air every time the private Banks make a loan. This little video spells it out in detail. The other stumbling block is that people do not understand why politicians would deliberately deceive them, and that New Labour are also complicit in that deceit. Most do not know the meaning of Neo-Liberalism, its origins and the impact it has had on the world economy for over forty years. So it is essential to explain both at the same time, so that people get the bigger picture. It really is time though that people on the left familiarised themselves with “Positive Money” and MMT (modern monetary theory). They do have their differences but both explain in simple terms most will understand how money is created and that the Banks should not be allowed to print it as debt. My own personal view is that we should nationalise the Banking system as a whole, simply because, if you don’t control all the money you can’t possibly control the economy, secondly you just can’t trust the Bankers. Professor Bill Mitchell is a leading academic that wants ordinary people to wake up to what is happening and has a regular blog which he uses as a learning tool for those willing to learn. In this one he attends a workers group in a pub and makes clear to them that they should all learn about economics because so many economists are lying to us. Please sign up to his blog and watch the video. If McDonnell had not understood all that Gould had referred to here then indeed we would be in serious trouble for future progress. My feeling is that he does indeed understand these issues. My interpretation has been that rather than try to deal with this issues in the abstract, (and that would be the case for most people and their understanding at the moment), he is dealing with that which is important and contextualised at the time in which it is seen as necessary to address it; as well as not inviting diversionary discussions at this time. He would indeed be a superb teacher-communicator if McDonnell attempted to run opposition policy at the same time as giving ‘abstract’ economics lessons. Putting McDonnell and his tactical choices aside, there are difficult and important problems for us when it comes to the statement that a, ‘Labour government would demand value for money and efficiency in the public sector’. On the capital investment side, I am personally in favour of HS2, HS3, HS4, HS5, HS6; both Heathrow and Gatwick expansions; building motorways in the West of England and moth – balling steelworks until nationalised or a buyer can be found (but for 5 years? 10 years? 15 years?). In general, I would argue that much of such choices are valuable investments, but unfortunately I have to recognise that some of these choices may be good value and others not so. Do we have technical criteria for making such decisions? When it comes to other investments, i.e. to rectify years of skills training neglect, much is needed. The training of thousands of medical professional (nurses) to replace those that we currently import from the Philippines’ government trained nationals subsidising the UK is an example. Avoidance of the payments to private agencies would suggest ‘investment’. But the decades and decades of very poor young person’s skill training through ‘apprenticeships’ and other ‘mimicking’ measures suggests poor ‘consumption’. I do not have the answers to these matters but when we do I think we will be in good position to form an effective government.